James Alton Caldwell was born at the William Beaumont hospital, Fort Bliss; El Paso, Texas on 20 January 1952 while his father was stationed at Ft. Bliss with the U.S. Army. Shortly after his father was released from the army, they returned to his home in San Angelo, Texas where the young Jim Caldwell was raised. There was a limit of available activities to participate except for the usual and traditional activities, baseball, football, basketball, and band. Sensei Caldwell’s father worked for the post office but had a passion for music in that he had played in the band in school and had spent time with the 65th U.S. National Guard Army Band. This was almost a pre-destiny for the young Jim to follow in his father’s footsteps in some form of music. The church the Caldwell family belonged to was Southern Baptist and had a good music program for all ages. Jim was signed up in the youth choir as start in his music training at the age of five years of age. When the young Caldwell was old enough which was age eleven in seventh grade he enrolled in junior high band starting on the clarinet. In the eighth grade he changed instruments to the bass clarinet which he stayed with all the way through college. While in college, at Angelo State University (ASU), Jim earned a place in the First College All State Band in the State of Texas. As far back as junior high school Jim Caldwell remembered having an interest in the martial arts. He always had a fascination with Karate and Japan and had a strong desire to go there. It was not until He joined the U.S. Navy in 1970 that this became possible. After his stint with navy he entered college at ASU graduating with a Bachelor of Arts degree in Drama and German language in 1977. To supplement his income while attending college Sensei Caldwell taught Karate-Do at the university he attended. While in college He enrolled in the U.S. Air Force R.O.T.C., receiving a commission upon graduation. Lieutenant Caldwell went on to serve in the air force on active duty until 1990 when he was discharged as a Captain where he subsequently entered into the Air force Reserves and was called back to active duty during Operation Desert Storm. During Operation Desert Storm Captain Caldwell’s responsibility was battle damage assessment. He finally retired as a Major 25 May 1997. Shihan James A. Caldwell started his study of Karate-Do in Sasebo, Japan in the style Shorin Ryu under tutelage of Yoriyuki Yasuzato 撰行安里 (Japanese for Azato) at his Sho Bu Kan 尚武館 martial spirit building Dojo in 1971 while stationed there in the U.S. Navy. Yasuzato Sensei was the grandson of the great Okinawan Karate teacher Anko Azato 安恒安里. After studying the Shorin Ryu curriculum to Sho Dan (1st degree) he resigned from Shorin Ryu to start his study of So Ryu Karate-Do under the So Ryu Soritsusha 創立者 founder, Michio Koyasu. Soke Koyasu was a student of Dai Shihan Kanken Toyama, founder of Shu Do Kan Ryu Karate-Do. Later in Shihan Caldwell’s career, because there was no governing organization for Soryu Karate-Do in the US, Soke Koyasu granted Sensei Caldwell permission to establish the foundation for the All Japan Soryu Karate-Do Federation, U.S.A. around 1987. Soke Koyasu felt, along with Sensei Caldwell, that establishing a U.S. organization would help standardize the Soryu Karate-Do curriculum world wide and provide a positive direction for all U.S. Soryu Karate-Do practitioners as well as diversify its leadership. Sensei Caldwell earned his Go Dan (5th degree) with his Shihan instructor degree on 11 February 1990. He received a special Bu-Do name, Tatsuo Koyasu 龍雄小安 Tatsuo meaning Dragon person. In the name Tatsuo, Soke Koyasu used the O 雄 person character from Michio. It is considered a great honor in Japanese culture when a person bestows a portion of his name to another. It is a sign of great devotion and closeness. As a requirement for his Go Dan, Sensei Caldwell created a Kata named Shin Ryu No Kata 心龍の形 Dragon Spirit Form. Assigning a name and the Kata creation requirement were originally from the Toyama/Shu Do Kan Ryu tradition. Soke Michio Koyasu appointed Shihan Caldwell as the chairman of the All Japan Soryu Karate-Do Federation, U.S.A., 10 September 1991. At the same time he declared Shin Ryu Kan, Shihan Caldwell’s school, as the U.S. headquarters in Omaha, Nebraska. Shihan Caldwell received his Roku Dan 6th degree 12 March 1992. Nana Dan 7th degree was achieved 15 March 1995. Finally, Soke Koyasu awarded Shihan Caldwell with Shihankan Grand Master Instructor 25 June 1996. The AJSKF, Soke Emiko Koyasu, promoted Shihan Caldwell to Hachi Dan 8th degree June 2014. The International Shudokan Association recognizing Shihan Caldwell’s hard work in getting proper recognition for both Kanken Toyama and Michio Koyasu promoted him to Hachi Dan 8th Degree and issued a proficiency title of Kyoshi on 18 January 2003. Shihan Caldwell had received elementary training and exposure to Okinawa Kobu-Do 沖縄古武道 in both Sho Rin Ryu and Soryu Karate-Do. Both of these styles had limited training available in Okinawa Kobu-Do. They both focused on the Roku Shaku Bo six foot staff and the Sai truncheon. Primarily, they only taught Kata. Shihan Caldwell always felt there was more to Okinawa Kobu-Do than what he had been exposed to. In 1982, Shihan Caldwell was assigned to Offutt AFB, Nebraska while in the U.S. Air Force. While in Omaha, Shihan Caldwell came across Shihan Mikio Nishiuchi 幹雄西内. Shihan Nishiuchi presented his Okinawa Kobu-Do as a separate martial art, which went far beyond doing just Kata. It included Kihon, Kata, and Kumite as well as Bunkai for the Kata. Thirteen weapons were studied in the curriculum. Shihan Nishiuchi was a part of and associated with the All Okinawa Kobu-Do Association founded and headed by Shimpo Matayoshi 眞豊又吉. Shihan Caldwell contacted Soke Michio Koyasu and requested permission to study this Kobu-Do as opposed to the So Ryu Karate-Do version. Soke Koyasu was excited that Shihan Caldwell had found such an organization in the U.S. fully endorsing and stating that the All Okinawa Kobu-Do Association far exceeded anything that Soryu Karate-Do had to offer. Being enthralled with finding this association and Soke Koyasu’s endorsement, Shihan Caldwell began his study of Okinawa Kobu-Do with Shihan Nishiuchi 16 July 1984. Shihan Caldwell was promoted to Sho Dan (1st degree) in Okinawa Kobu-Do 6 January 1988. Shihan Caldwell was finally promoted to Go Dan (5th degree) 13 June 1995. Shihan Nishiuchi recognized Sensei Caldwell’s long dedication by promoting him to Shihan, Instructor degree, in Kobu-Do 12 October 1996 being the third person in the International Kobu-Do Association to receive the Shihan title. 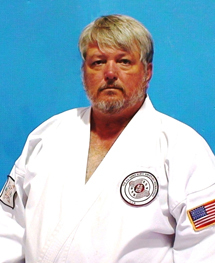 Shihan Caldwell became a charter member of the original organization in 1984 and when Shihan Nishiuchi founded the International Okinawa Kobu-Do Association in 1990 he became a founding charter member. Shihan Caldwell initially received Ju-Jutsu training with Yoriyuki Yazusato in his Sho Bu Kan 尚武館 Dojo in Sasebo, Japan. This was in conjunction with his Karate-Do and Kobu-Do training. Sensei Yasuzato taught Nage Waza 投げ技 throws, sweeps and take-downs more in line with the Kito Ryu system of Ju-Jutsu. When Sensei Caldwell changed styles and schools from Sensei Yasuzato to Sensei Michio Koyasu (Kiro Nagayama) at the Soryu Kan Dojo 総流館 in Sasebo, Japan he continued his Ju-Jutsu training in the Nagayama family’s Bai Shin Ryu Ju-Jutsu 梅心流柔術. Bai Shin Ryu Ju-Jutsu emphasizes Kansetsu Waza 関節技 joint technique and is circular and flowing. It is an Aiki-Jutsu 合気術 based system. Shihan Caldwell founded The All International Bai Shin Ryu Ju-Jutsu Federation 全国際梅心流柔術連盟 in 1978 incorporating technique from both of his teachers with primary influence from Koyasu Sensei. Shihan Caldwell was promoted to Go Dan 5 Degree with a Shihan instructor degree 11 February 1990. Hanshi George Anderson issued a rank homologation from the Kwan Mu Kan International. With Soke Koyasu’s blessing and because of a strong friendship with Hanshi Anderson Shihan Caldwell aligned his Bai Shin Ryu Ju-Jutsu system with Hanshi George Anderson and the Kwan Mu Kan International Association 20 March 1992. Shihan Caldwell was promoted to Roku Dan 6th Degree on 20 March 1992 and was recognized with a Renshi proficiency title 10 July 1992. Shihan Caldwell was next promoted to Nana Dan 7th Degree on 16 July 1995. He was recognized with a Kyoshi proficiency title 10 January 2000. On 18 March 2000 Shihan Caldwell was promoted to Hachi Dan 8th Degree. Directions to Caldwell's Shin Ryu Kan.